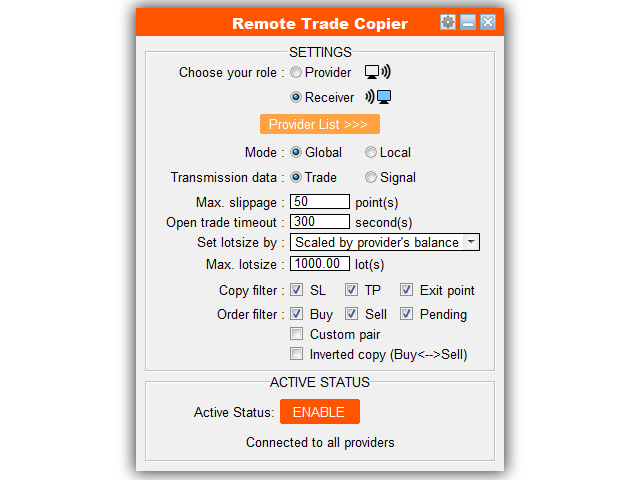 Unlimited Trade Copier Pro MT5 is a powerful tool to copy trade remotely between multiple MT4/MT5 accounts at different locations over internet. 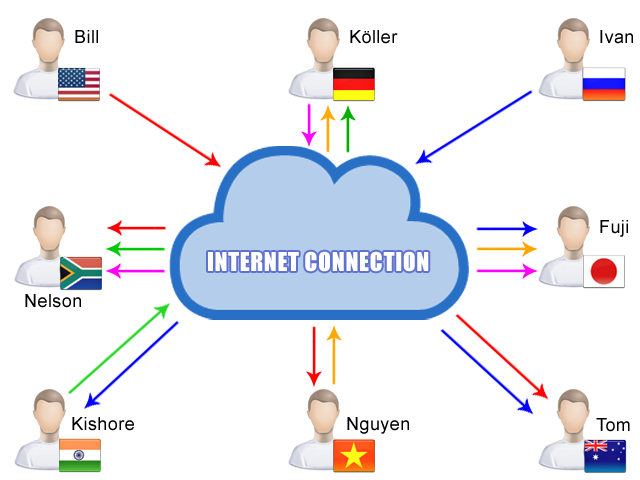 This is an ideal solution for signal provider, who want to share his trade with the others globally on his own rules. One provider can copy trades to unlimited receivers and one receiver can get trade from unlimited providers as well. The provider can set the subscription expiry for each receiver, so that receiver will not be able to receive the signal after that time. Copy between MT4 and MT5 accounts. Switchable between Provider or Receiver role within one tool. One provider can copy trades to unlimited receivers and one receiver can receive trades from unlimited providers. Provider/Receiver can manage his Receiver/Provider list via powered database managing system without additional tool (add, remove, edit, enable/disable, set expiry). The provider can set the subscription expiry for each receiver, so that receiver will not be able to receive the signal after that time. Provider/Receiver list can be edited either inside MT5 or by exported .csv file. Switchable between Remote mode (copy over internet) and Local mode (copy within the same PC/Server). Switchable between Trade protocol (copy trades) and Signal protocol (send/receive signal alert only). By default, SL/TP modifications, not only Entry and Exit, will be copied, so it's more secure for receiver in the case the connection is lost or terminal is down. But provider have the right to hide SL, TP and order modification (just copy entry and exit) to hide strategy from receiver. Protect receiver from slippage and outdated orders. Auto recognize and synchronize symbol prefix/suffix between brokers. Allows up to 5 special symbols setup (i.e. : GOLD --> XAUUSD, etc.,). Multi lot size setting options for receiver. Allows to filter copy either SL or TP or exit point. Allows to filter which type of orders will be copied for both provider and receiver. Allows inverted copying for both provider and receiver. Auto send mobile notification and email to receiver when account has new activities. 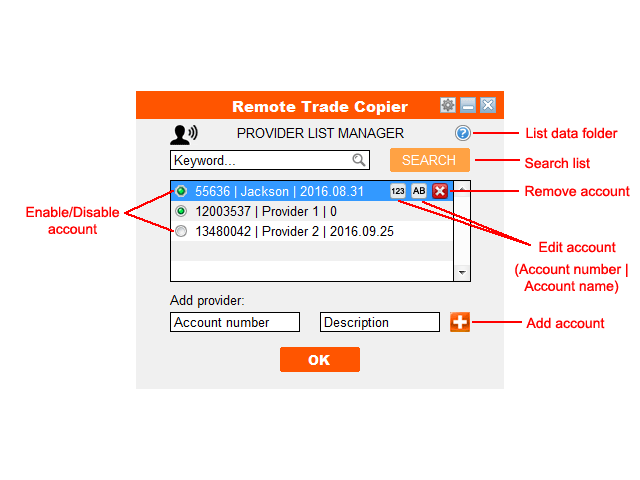 Install Unlimited Trade Copier Pro to any chart (but no more than one) of Provider's MT5 terminal. 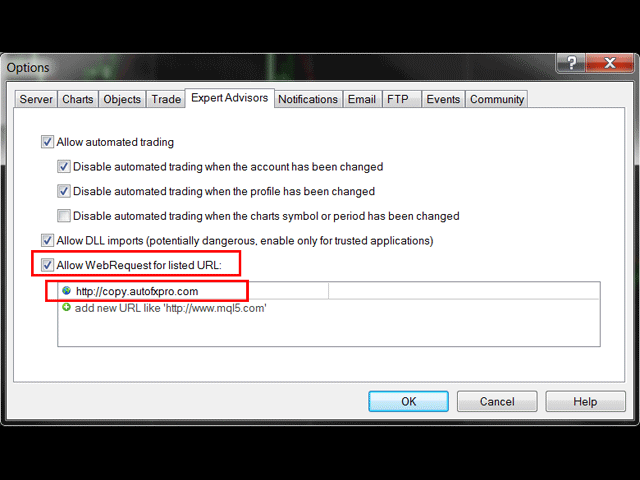 At the first time, it may require you to add "http://copy.autofxpro.com" URL to MT5's trusted URL list in order to let the tool access the internet connection. 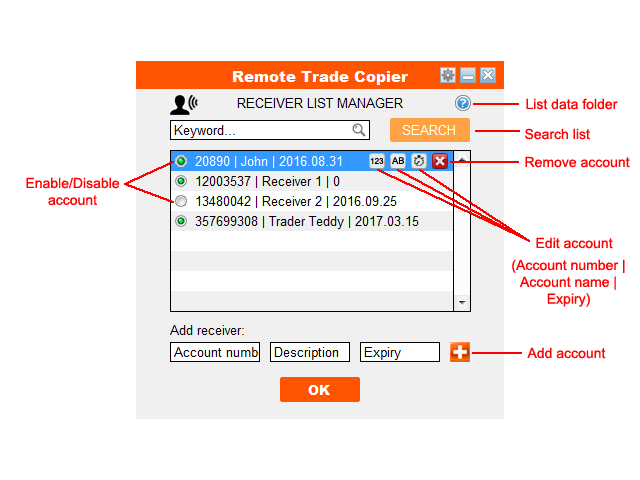 Choose the role as "Provider", then go to "Receiver List" and add receiver account number that you want to copy trade to. Only account numbers that enabled in your list have the right to receive trade/signal from you. You can set expiry for each receiver. Please note that expiry must be in format "yyyy.mm.dd". For example: "2016.08.31". If you don't want to set expiry to a receiver, just set it as 0. Go back to main control panel and turn status to Enable. 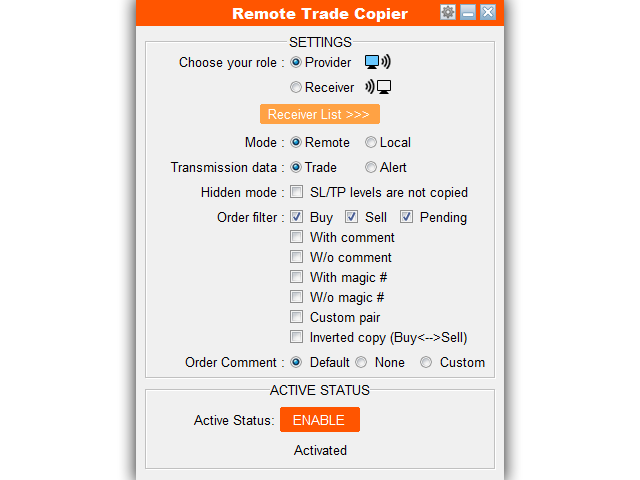 Download Trade Receiver Free and install it to Receiver's MT5 terminal with the same procedures. - Fixed: Error between accounts with different contract sizes. - Improved: Better partial close and closeby management from MT5 to MT4. - Improved: Convert contract size of CFDs and Indexes between different brokers. - Improved: Load saved order faster after restarted. - Improved: Auto hide Prefix&Suffix setting if the account has only one symbol for each pairs. - Improved: Better copied order management. - Improved: Better prefix & suffix recognition. 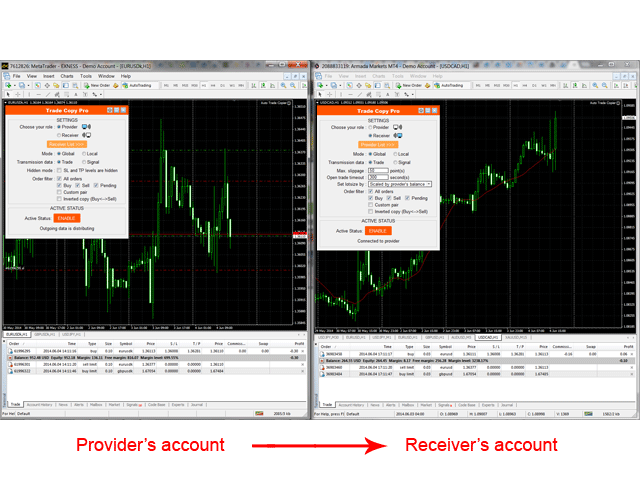 - Improved: Add Prefix & Suffix option for receiver if there are more than one symbol for the same currency pair. - Improved: Support duplicate trades within the same account. - Fixed: Minor bug with copy same order comment from MT5 to MT4. - Improved: Better copied orders management. - Improved: Better orders management when switching between multiple PCs/VPSs. - Fixed: "Stoploss Risk Percent" with small lotsize. - Improved: Adapt with some brokers that set their profit currency in pair incorrectly. - Fixed: "Can not set millisecond timer" error fixed. - Improved: Faster copying due to shorter account checking. - Improved: Code optimized due to new version of MT5 platform. - Fixed: Better interface graphic object selection. - Improved: Speed up at receiver mode. - Fixed: Still manage copied orders correctly after move to another PC/VPS. - Improved: Increase data reading speed in remote mode. - Fixed: Auto reconnect HTTP request if failed. - Fixed: Fixed lotsize bugs. - Fixed: Alert multiple times if copy server's URL is not added. - Improved: Copy between MT4. - Improved: Auto recognize the difference of metal symbols between brokers (XAUUSD <-> GOLD, XAGUSD <-> SILVER). - Improved: Optimized some functions in source code in order to make it run smoother. - Removed: "Trade Timeout" is removed. Orders will be copied at anytime as long as it has the same or better price of source's order.